Your company or organization may already be hosting great events, but are you developing a sound content marketing strategy to make those events more engaging? Are you actually turning events into content? Events pack a powerful content marketing punch, because people attending events will remember their experience at your event far longer than they’ll remember reading a blog post. If you start approaching events with the same strategic focus you give other forms of marketing, you can capitalize on this powerful source of content. My company, Localist, creates online event calendars to serve a wide variety of organizations, and we’ve seen firsthand how our customers capitalize on events as a source of content. Being data enthusiasts, we wanted numbers to attach to what we’re seeing. We recently surveyed users of more than 40 of our customers’ calendars to ask them about how they interact with the calendar, and how they find out about the latest events. Their answers drove our point home: Focus on transforming events into content to build your brand and drive engagement before, during, and after your events. You can download the full results here, but we’ve pulled out some key statistics in this post. Note that the survey was performed at higher education institutions, but the lessons apply to any organization. Events offer a great opportunity to connect your online content marketing strategy to offline, in-person interactions. Start by giving your events a prominent place online. 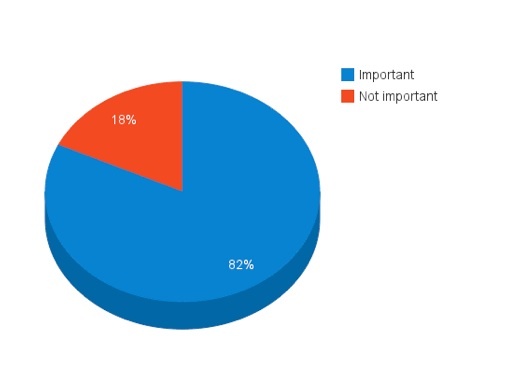 Our survey respondents certainly value being able to access information about events online: As you can see in the chart below, 68 percent said the online event calendar was one of the most useful features of our website. Survey question: What are the most useful features of our website? Remember: Your online content begets offline content, and vice versa. So cross-promotion is a win-win for all aspects of your content marketing plan. Events are built on social interactions, so logically it follows that people would want to talk about events with other people who plan on attending. In fact, 53 percent of our survey takers said being able to leave comments on online event listings was important to them. Organizations strive to create memorable events that will prompt attendees to keep the conversation going. Because offline interactions have more staying power in peoples’ memories than a brief online exchange, creating powerful event-related content gives your audience reasons to stay engaged with your business long after an event has ended. To use this to your advantage, encourage attendees to leave reviews on your online event calendar, blog about their experience, and even post pictures of the event on their own social networks. And, if you are seeing a lot of organic conversations taking place around your events, you can harness that enthusiasm by featuring key attendee posts, photos, and/or reviews on your blog or event site. Do you struggle to send out emails or newsletters that people actually open, rather than relegate to the dark depths of their email trash? Here’s some encouragement that your efforts aren’t being wasted: Among our survey respondents, 82 percent said they want email reminders for events they’re interested in attending. Survey question: How important is it that you can receive reminders for events you’re interested in? In addition, 59 percent reported that they would like to learn about events via an email newsletter. By giving event details a prominent spot in your email content, you’ll benefit from better open rates and more engaged email recipients. You can then direct your readers to other event-related content, such as blog posts, hashtags, or your event calendar, for more details. Don’t leave event listings out of your content marketing strategy. Posting event listings on an online event calendar provides a marketing “two-fer,” because the event listing can serve as content that can be just as valuable as the content delivered at the actual event. Let’s look at a college events calendar as an example. While current students may enjoy attending on-campus events, prospective students may be interested to see that there is a rich variety and robust quantity of events listed. For instance, our survey found that 62 percent of current students said they visited the college’s website to research the local social scene before deciding to attend the school. By applying content marketing best practices to event listings, colleges can make themselves seem more interesting, engaging, and appealing to these prospective students. You wouldn’t haphazardly publish a blog post without ensuring that it had interesting content, a title that will hook readers in, and great visuals, right? Event listings should receive the same content marketing care and consideration. Let’s take photos, for example. You may already know the power images wield. They correlate with double the number of page views, help sites rank higher in search results, and get shared more often than content that doesn’t have a visual component. Well, event listings are the perfect place to showcase interesting images along with your captivating content. Go ahead and get creative with event descriptions and details. Maybe even throw a video in there. According to our survey, 61 percent of respondents want to see informative and engaging details included in event-related content. And when the event is over, you can update your web and social media content with pictures of attendees and their activities, to extend the conversation and start to generate excitement for your next event. People often share links to event listings on their own sites or social media accounts, which will help you increase back-links on your site and demonstrate your site’s popularity to search engines. Keeping your online events calendar chock full of fresh content will help you easily grow the number of pages on your website. In addition, creating unique meta titles and meta descriptions for each event listing will help you rank higher for keywords your attendees and target audience are searching for. One way to step up audience engagement with your content marketing is to encourage user-generated content, as people often feel more connected to your organization and your events when they are given the opportunity to submit their own content. In fact, 60 percent of our survey respondents felt it was important to add their own events and opinions on event calendars. Moreover, it fosters a sense of belonging that can translate into increased page views, engagement, and event attendance. With the rising ownership of smartphones, delivering content that’s targeted to and formatted for mobile use is more essential than ever. Our survey takers certainly recognize the importance of this strategy, as 78 percent of them said they were interested in accessing event details through a mobile calendar app. Survey question: What features would you want in a mobile calendar app? When creating event listing content for the mobile audience, be sure to incorporate responsive design techniques that optimize the experience regardless of the device it’s viewed on. Or, by offering your events calendar content through a dedicated app (like this one, created by Flirt Interactive for Content Marketing World 2013), you can focus your content marketing strategy on the specifics of engaging mobile users. With these eight ideas in your marketing arsenal, you should be well-equipped to transform your events into powerful content marketing. It won’t be long before your online events calendar turns into your best (non)secret content marketing weapon. Has your business started turning events into great content? We’d love for you to comment and share your thoughts and ideas. See more examples of content marketing in action at live events by registering to attend Content Marketing World 2013, September 9–11 in Cleveland, Ohio. As the CEO of Localist, Mykel Nahorniak develops and evolves the strategy of Localist as a product and company. His vision for connecting people to the events they care about is powering the calendars available to over 800,000 users. You can find Mykel on Twitter as @mvkel.